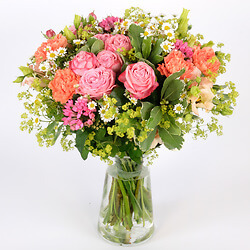 Beautiful tulips in shades of pink, arranged into a round bouquet... A bouquet of flowers exuding natural freshness and beauty! 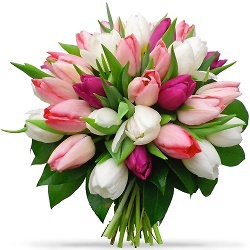 The colours of the tulips in the bouquet depend on availability at the florist's. 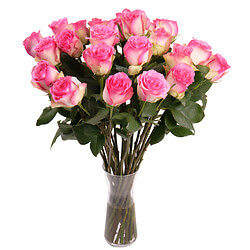 Arrangement of pink roses, seasonal flowers and flowering greenery in shades of pink enhanced by dark green foliage. 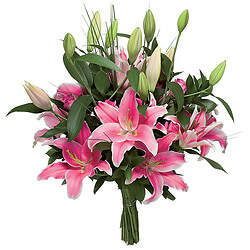 Your flowering arrangement is presented and hand-delivered in a pretty decorative container. 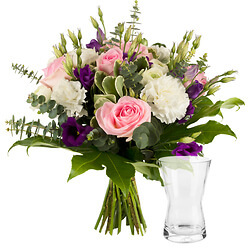 Elegant bouquet in red, pink and white tones, assembled in a country spirit. 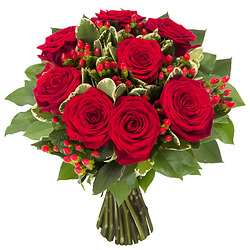 Red and pink roses, associated with delicate white flowers, airy and set with beautiful green foliage and variegated. 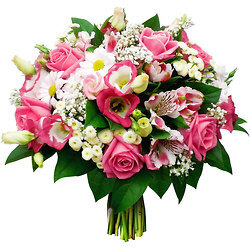 A Mother's Day bouquet of flowers, tender and delicate, to offer happiness and wish your mother a beautiful day! 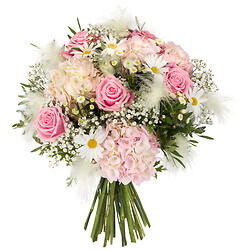 A round Mother's Day bouquet composed of seasonal flowers in shades of pink and white, wrapped in fine foliage. 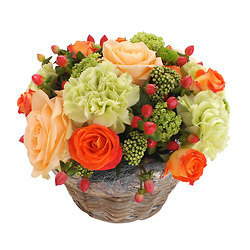 Generous arrangement of roses and seasonal flowers in shades of orange and green. 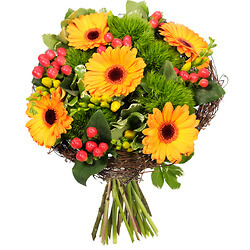 A colourful and invigorating arrangement, for any occasion! 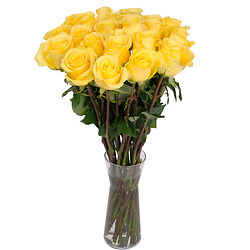 Your arrangement of roses and flowers is presented and delivered in a pretty wicker basket or a pretty container. 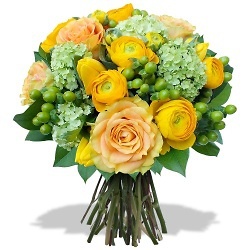 A superb round bouquet of buttercups... A natural delight for the person who receives it! 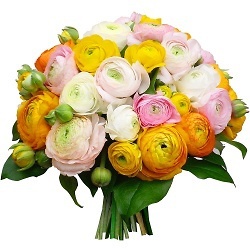 An arrangement of buttercups in a variety of colours, depending on availability of the florist's. 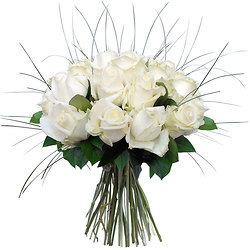 A lovely bouquet of white roses complemented with delicate greenery, set in a ring of delicate glossy foliage. 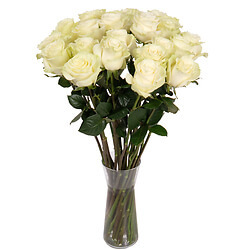 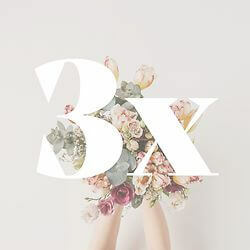 Medium-stemmed white roses arranged into a round bouquet. 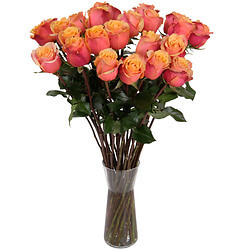 A touch in the heart: offer this delicate bouquet of roses and flowers ... 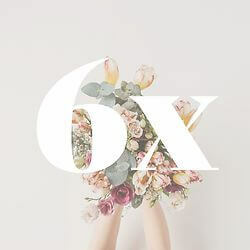 Seductive! 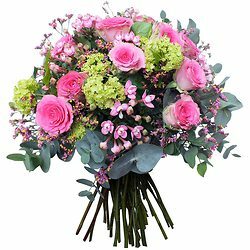 A compact and chic bouquet of flowers, a beautiful blend of roses in red and pink and delicate flowers in white tones set with beautiful green foliage. 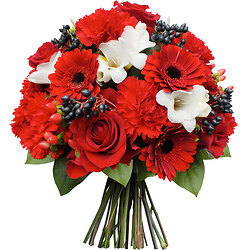 A generous round bouquet composed of flowers in shades of red and white,with touches of black. 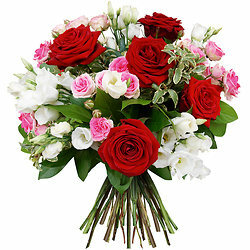 A bouquet sending a message of life! 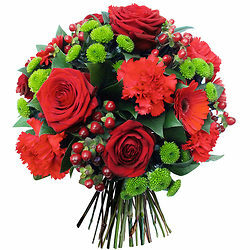 Roses and red seasonal flowers, small white flowers, red and black seasonal berries, dark green foliage set in a discrete ring. 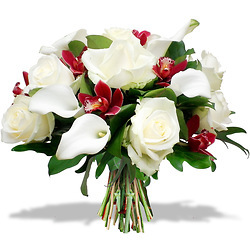 An elegant round bouquet of flowers, composed of white seasonal flowers accenting orchid flowers, decorated with delicate foliage. 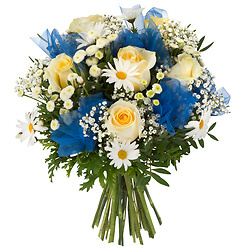 A noble bouquet of flowers to be gifted to delight the heart and the eyes! 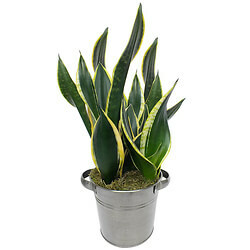 Sanseveria is very decorative, earning it a new wave of success! 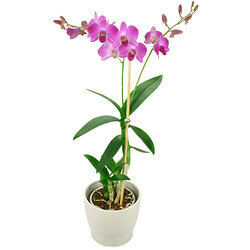 This purifying plant absorbs toxic substances such as trichlorethylene and benzene. 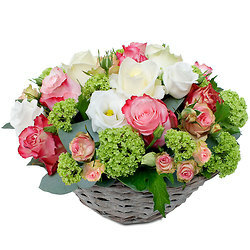 A delicate arrangement of green and flowering plants in shades of white and green. 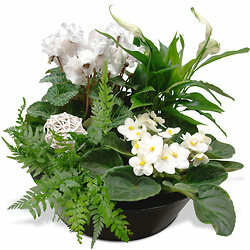 A very decorative and very Zen mini garden of plants which will suit any interior. 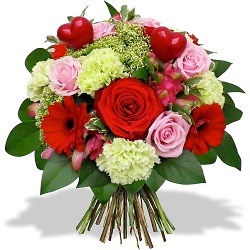 For yourself or someone special, for any occasion! 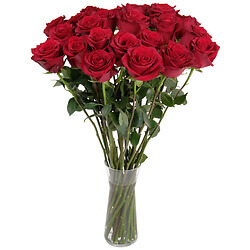 A sophisticated flower and a sleek presentation ensure that the person receiving it will love showing it off! 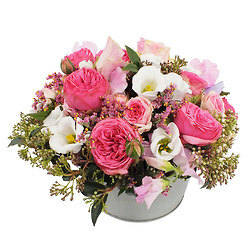 Delivered in a beautiful decorative pot. 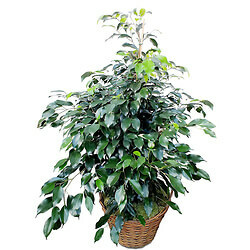 The quintessential indoor plant, the Ficus is undemanding and resistant. 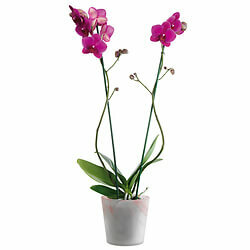 Ideal as a decorative plant, the Ficus cleans the air around it. 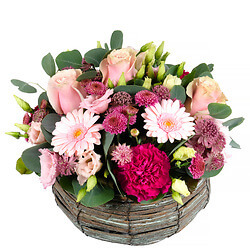 Delivered in a planter or a wickerwork basket subject to availability at the local florist's. 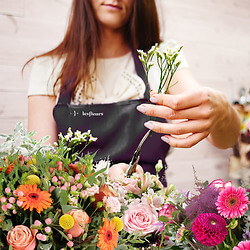 Combining aesthetic value, robustness and ease of maintenance, Dracaena is one of the most popular house plants. 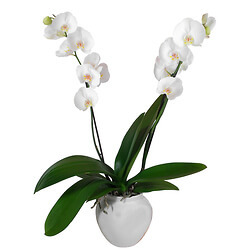 An aesthetically-pleasing gift due its exotic nature, Dracaena purifies the air around it. 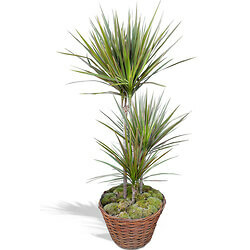 Dracaena delivered in a pot with a planter or a wickerwork basket. 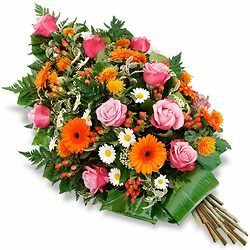 Funeral sheaf of flowers in shades of orange and pink decorated with beautiful foliage. 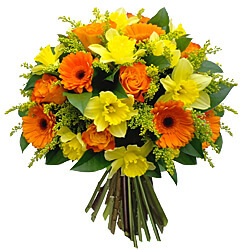 A sheaf of flowers to express sincere condolences and moral support. 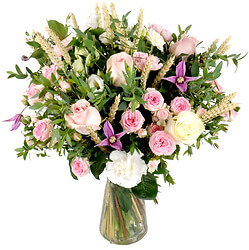 Superb racquet of flowers for bereavement, composed of pink and white flowers held together with beautiful foliage. 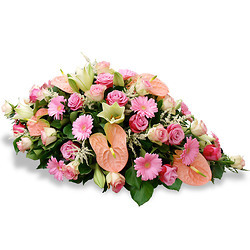 Racquet of bereavement flowers to express sincere condolences. 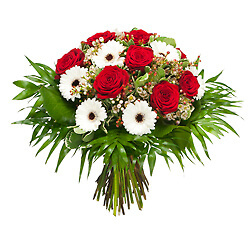 Racquet of flowers for bereavement composed of red roses and very beautiful seasonal flowers in shades of red and white, with fine and delicate foliage. 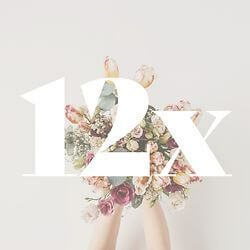 Racquet of bereavement flowers to express sorrow. 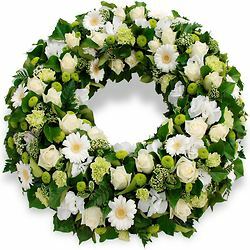 Funeral wreath composed of seasonal flowers and roses in shades of white and cream, held together with fine and delicate foliage. 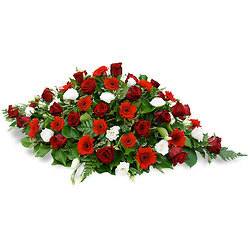 A funeral wreath to express support and sympathy. 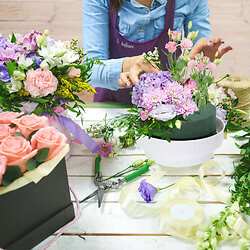 A mourning bouquet assembled in the form of a sheaf, composed of white flowers and very pretty greenery held together with a white ribbon... A bouquet of compassion, a gift wishing serenity. 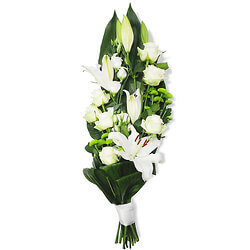 A mourning bouquet composed of white lilies, white roses, and white and green seasonal flowers, accented with decorative leaves.